Leave your worries behind while relaxing on the second story veranda, sipping a glass of fine Illinois wine. Sunsets of breathless beauty disappear over the ridge behind the six acre vineyard. Utilizing pasture-land, owned by the Sams family since 1841, they along with students from Blackhawk College planted 1,500 grape plants on three acres west of the house. 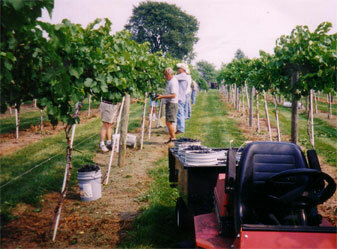 Preparation work began that fall to extend the vineyard. The following spring, another three acres were added bringing the total to six acres containing 3,000 plants. Joining a coalition of experienced grapegrowers and winemakers throughout the state, Illinois Grape Growers and Vintners Association, Fred decided to plant varieties suitable to the climate in Stark County and also be the grape of choice for producing the best quality wines. Marechal Foch and Frontenac, red varieties, make up most of the acreage with a small number of white varieties including LaCrosse, St. Croix and St. Pepin. Development of the vineyard began over ten years ago by the descendant of David Nicholson, Fred J. Sams the 5th generation of the same sesquicentennial farmland purchased in the early 1800's. Located along what was once called Old Main, the only connection between Toulon and Kewanee at the time, it is said that Abraham Lincoln stopped to rest in the upper room of the home (now called the Chateau) before continuing on his campaign route in Northern Illinois. 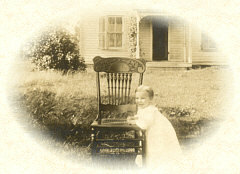 The last settlement of the Pottawatomies in Stark County was located on the farm and slight indentations left by the stagecoach on route to Galena can still be seen in the pasture. Indian Creek Vineyard, located in Toulon, Illinois has an 11 acre vineyard consisting of 1 acre of Leon Millot, 5 acres of Frontenac and 5 acres of Marechal Foch. These grapes are well taken care of throughout the season and make an excellent product for the winery or the person making wine at home. The grapes are picked at just the right time and immediately put into a cold storage facility until they are picked up or delivered. We charge $1,000/ton for the Foch and Leon Millot and $1,100/ton for the Frontenac. 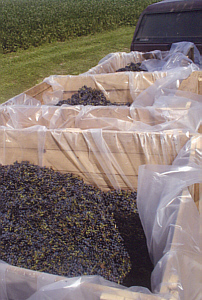 We offer grapes that are crushed and destemmed for the person making wine at home. Please place your orders ASAP by calling Fred Sams at 309-286-5302 or 309-525-5302 and use the same numbers if you have any questions. Your order will be confirmed and you will be called prior to picking to set up a time for you to pick up your juice. Individuals must provide their own containers. For the grapes that are crushed and destemmed we charge $8/gallon for the Foch and Leon Millot grapes and $8/gallon for the Frontenac. 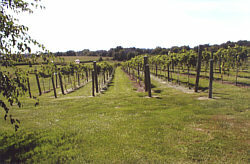 A view of the vineyard looking west from the Chateau. 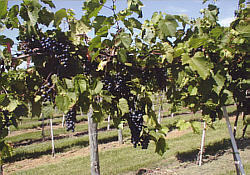 Grapes ripening on the vine, prior to the harvest. Grapes are gathered and sorted during the Fall harvest.